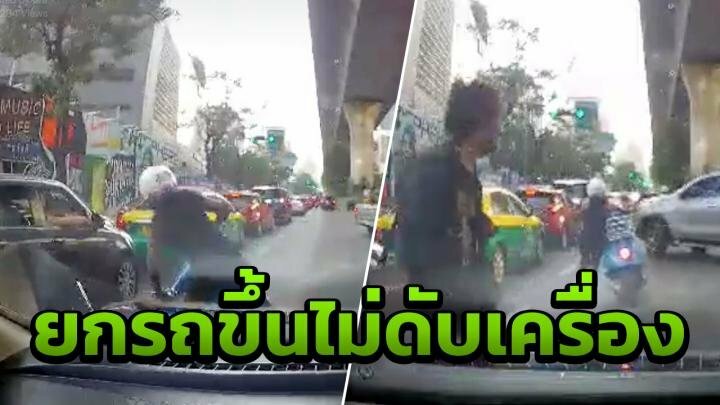 Dash cam footage going viral on social media shows a woman on a blue scooter come off in front of a car preparing to make a turn yesterday afternoon. She gets back up and is helped momentarily by a passer-by but she appears to have revved the accelerator. She is instantly propelled into the back of a red car parked some distance ahead. A post on "Hia" on Facebook suggested that the woman didn't know that some bikes are "auto". Here at Thaivisa we suggest that walking might be safer. It just gets better, how the hell did she ever think that she could ride a scooter? Keep death off the roads. You can't change it........ so why bother. Have a look at this lunatic. And keep the helmet on whilst walking! How would you like to be married to her? She does something wrong, immediately points a finger at you, then makes everything exponentially worse. So Thai. So many similar videos in the net. A good case for ensuring that the scooter you buy has 'idle stop' and make sure it's always enabled. This is an easy mistake to make when in a bit of a panic. It was on idle stop, and when she pushed it, she turned the throttle at the same time, and it started and took off! I did the same thing, on my new click. Fortunately, the bike only hit the plastic garbage can, not a car of person. Maybe the bike shop could give a bit of info on this subject. Any wonder why there's such a catastrophic casualty rate on the roads here .. There is a song colinneil from about 1973 by Capability Brown , it is called ' Keep death off the road , drive on the pavement '. Go on look it up .